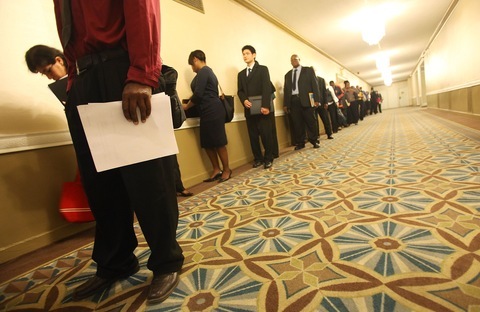 Job seekers line up at a job fair last week in New York City. Photo by Mario Tama/Getty Images. Friday’s monthly jobs report was the last before November’s midterm elections and it likely did little to alter voters’ discontent about the state of the U.S. economy. The unemployment rate was unchanged at 9.6 percent in September, the Labor Department reported. Overall, the economy shed 95,000 jobs last month. The loss of government jobs led the way with a decline of 159,000, a combination of temporary Census 2010 workers seeing their terms come to an end and job losses in local government. The private sector continued to trend up modestly, adding 64,000 jobs. On Friday morning, President Obama is slated to tour a small business and deliver remarks in Bladensburg, Md., just outside Washington, and will likely tout nine straight months of private-sector job growth. But Republicans were quick to hit Democrats on the fact that jobs were lost. “This report is not only the final affirmation of the failed job-killing policies of Washington Democrats, but it frames the national political debate from now until Election Day. There is now no doubt that this election will be a referendum on the Obama-Pelosi agenda that has created chronic unemployment and paralyzed the free enterprise system, ” said National Republican Campaign Committee chairman Rep. Pete Sessions of Texas in a statement. David Plouffe, the architect of President Obama’s successful 2008 campaign, met with reporters at the Democratic National Committee on Thursday to set expectations (low for Democrats, high for Republicans, of course) on 2010 midterm results. Plouffe has been charged with overseeing the DNC/Organizing for America effort to reach first-time Obama voters from 2008 and urge them to get to the polls and vote for Democrats in 2010. The president’s former campaign manager talked of Democrats beginning to narrow the enthusiasm gap that has been much discussed this political season. Citing examples from his polling research, Plouffe claims that in June, 75 percent of Democrats said they would definitely be voting in Tom Perriello’s competitive fifth congressional district race in Virginia. Now that figure is up to 84 percent, Plouffe said. “That progress has to continue. No one’s comfortable with where we are today,” he cautioned. Unlike other Democrats in recent weeks seeking to keep supportive donors and volunteers fully engaged, Plouffe never made the declarative prediction that Democrats would keep their House majority. He also appeared to be installing some insulation for President Obama’s political operation should things go south. Plouffe also believes his party is benefiting from the high profile, Tea Party-backed candidacy of Christine O’Donnell in Delaware. He also expects that President Obama will likely be running against a Republican nominee in 2012 who represents the far right wing of the party. Ohio’s gubernatorial candidates met Thursday night in a feisty final debate before voters go to the polls on November 2. The nearly hour-long meeting at the University of Toledo produced plenty of heated exchanges between Democratic Gov. Ted Strickland and former Republican Rep. John Kasich over the economy, taxes, Wall Street and the size of government. Recent polls show the race narrowing after Kasich had a double-digit lead early last month.